Ten of the days we spent in Norway were in the fjords, and Joe and I both agree it was the most beautiful place we have ever traveled to. There were all of the things I love about the PNW without all the people; just mountains, water, and little farms. We did a ten day hiking and kayaking tour run by Nordic Ventures (the same company that runs the REI trip here) which I would highly recommend. This tour allowed us to get way off the beaten track. We had so many unique experiences, from a rainy campsite on the shore of the Nærøyfjord to a woodfired hottub precariously placed on a cliff above the Aurlandsfjord, and even summitting the tallest peak in Norway after roping up to cross a glacier. The trip was a series of challenges and rewards, and I felt so inspired every day. I have some hikes to share in detail, but I want to start the same way we did: journeying into the fjords. 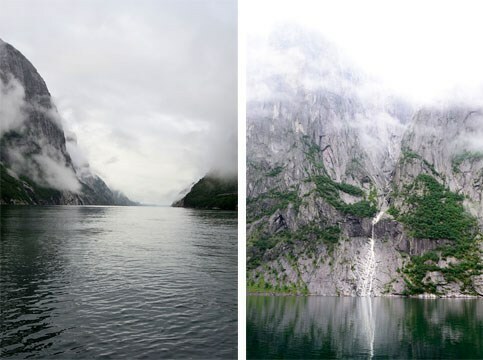 These photos were taken as we ferried into the Lysefjord on Day One.